Face it: Microsoft is on a roll. The vast majority of computers being used today–close to 300 million–run MS-DOS, Windows 3.x (with MS-DOS), or Windows 95 (with MS-DOS). The vast majority of new systems being shipped–at least another 50 million a year–come with Win95 pre-installed. Other operating systems are losing ground and market share. At this rate, the year 2000 will dawn on half a billion or more computer systems worldwide running MS-DOS and/or Windows, along with many of the applications we use today. And as all this happens, the rest of the industry–indeed, it would seem the rest of civilization–increasingly focuses upon Microsoft technology. Heck, even IBM finally threw in the towel and is officially supporting Windows, despite owning (and having sunk a few billion dollars into) OS/2, which most independent observers consider superior to the various Microsoft offerings. Apple, attempting too little too late, is too busy trying to survive to represent a threat. The Windows/MS-DOS standard is expanding unimpeded through the world. And that, ultimately, could be Microsoft’s bane. You see, the dominance of Windows/MS-DOS is just the latest example of a common phenomenon. It seems that the first sufficiently adequate technology in a given sphere usually gains broad acceptance and entrenches itself. There may be some contention for standards early on, but that eventually settles out. And once the solution gains acceptance, the rest of civilization reinforces it–through market forces, legal standards, competitive pressures, and economic incentives. Once the technology is entrenched, the focus is then on refinement and slow upgrading of the existing technology, not on radical innovations and wholesale replacements. This has been shown time and again in major areas of applied technology: communication (phones), transportation (cars), and so on. And the same thing is happening now with information technology. Think about it. The most broadly installed and used operating system in history is MS-DOS, a fifteen-year-old knock-off of an even early OS, CP/M. Microsoft’s greatest marketing challenge with Windows wasn’t competition with OS/2 or MacOS. It was getting MS-DOS users to upgrade to Windows, and that didn’t even begin to happen until Windows 3.0, the fourth release (after Win1.0, Win2.0, and Win386). Even then, the growth in the Windows 3.x installed base came less from users upgrading than from new computers being shipped with Windows pre-installed. Microsoft has faced the same problems with Windows NT and Windows 95. Market acceptance of WinNT has taken longer than expected to build. Meanwhile, both corporate and home users of Windows have been slow to upgrade to Win95. Again, growth in installed base has come largely from systems shipping with Win95 installed. This, then, is the crux of Microsoft’s problem: users are and will continue to be reluctant to upgrade. The legacy base for Microsoft (and third-party supporters) will grow and will be slow to change over. And that base will be so mind-boggling huge within the next few years that any desire on Microsoft’s part to introduce any significant innovations in operating system technology will be seriously hindered. To date, Microsoft has managed to sidestep this problem by bundling new OS releases with new computer systems. But that will yield diminishing returns over the next 10 years as the number of computer systems in use approaches a measurable fraction of the total human population on earth. The year 2006 will probably see somewhere between one and two billion computers worldwide, and 95% or more will be running Windows. The sheer scale of adoption of Microsoft technology will provide tremendous momentum to keep thing moving in the same direction. The investment in hardware, software, market standards, training, business process, development expertise, custom applications, and deployed environments all argue against any broad changes, even those introduced by Microsoft. That investment grows year by year and will dominate more, not less, as time goes on. That is the final irony. Like it or not, Microsoft is stuck with Windows for the long haul. Attempts to replace it at some point in the future will run into all the same problems that any competitor would have, except–maybe–having to market against Microsoft. Efforts to change will face diminishing returns. And even a brand new OS, written totally from scratch, would have to support so much of Windows’ behavior that it will be chained down by its legacy. As impossible as it might seem, Windows may still be dominant in 2025, nearly 30 years from now. It may look and work a bit differently, just as phones, TVs, and cars from 30 years ago do, but the principles will be the same. Our grandchildren will wonder about the quaint relics of terminology and work flow (when was the last time you actually put gloves in a glove compartment? ), but they’ll be able to clearly see the inheritance from MS-DOS/Windows to whatever they use. And they’ll accept it as part of everyday life, not knowing what better dreams we–and even Microsoft–had for the future. We just didn’t realize we were already there. [UPDATE: 09/18/2013] A few thoughts after the post. First, and this is important, the (current) chart above is only for desktops and laptops — traditional PCs in other words. It does not include mobile devices such as smartphones and tablets. If you include those, then Microsoft’s share of installed base goes down from 91% to 35%. Second, some Windows pundits are getting excited about an increase in the Windows 8 adoption rate and a decrease in the Windows XP market share. I’m not sure whether they take into account that it takes a special effort to buy a Wintel laptop or desktop without Windows 8 pre-installed. Third, look carefully at the chart above and look at the (tiny) wedge for Windows Vista. Vista was released in 2005 and was Microsoft’s flagship OS until Windows 7 was released in 2009, four years later. This means that most new PCs and laptops sold during that four year period had Windows Vista pre-installed. Yet Vista’s market share (by most accounts) never got above 20%. Now, Vista’s market share is down to just 4%. This means that not only was the market reluctant to adopt Vista, but it also abandoned Vista wholesale once Windows 7 (which now has a 45% market share) came along. I suspect were Microsoft to release a Windows 9 that was a new-and-improved version of Windows 7, we’d see the same phenomenon with Windows 8 — it would shrink to a tiny wedge. But I’m not sure Microsoft has that option open to them; they may well have bet too much on the Windows 8 codebase without leaving a path to do such a version of Windows 9. In which case, they may be truly hosed. Your mileage may vary. ..bruce w.. The problem with releasing a Windows 9 that is an improved Windows 7 is that the line is blurring between the different types of computers. Is the Surface Pro just a tablet? It seems to me that if you get the keyboard with it, it pretty much functions like a laptop, just a bit smaller screen. And hooked to a large monitor, it can be your desktop computer. But Windows 7 is not designed for touch. Touch is the key thing now. Based on my limited experience so far, most people like touch-enabled tablets and computers. And for touch, Windows 8 is, in my opinion, quite good. I do not do any real ‘work’ on my iPad since the day my document that I was working on just disappeared and I had not emailed it to myself to ‘save’ it. 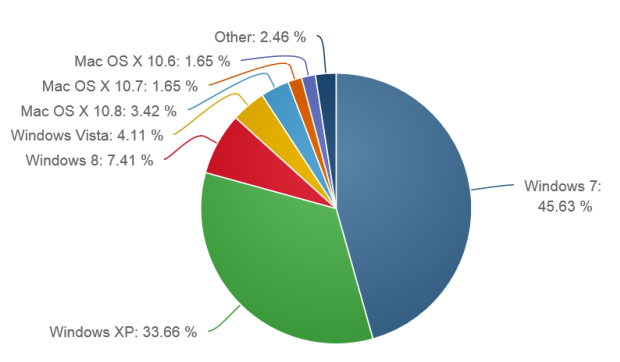 But there is one big factor that I see which tells me that Windows will continue to have significant marketshare: what other OS could manufacturers (HP, Dell, ASUS, Acer, Lenovo, etc.) put on their computers? From my point of view (consumer software guy), Android makes me shudder. Chrome is currently browser based, thus not interesting ((I don’t follow it closely enough to know if Google is trying to make it a desktop computer OS). The wringing of hands about how different Windows 8 is seems absolutely normal to me. We humans prefer things to stay the same. But Microsoft folks see the handwriting on the tablet – touch is the future. So they have made a big move. The question now is, will we see really good software being developed for Windows 8 (i.e. Metro, or Windows-store apps). Right now there’s almost nothing there (besides games). And, will price points be high enough to support major products. Right now, the expectation for App-store pricing seems to be very, very low. But in the end, I don’t think Microsoft is hosed, at least not until a strong competitor comes along that gets Dell, HP, etc. instead of Windows. Hey, there! Thanks for stopping by and taking the time to comment! I don’t think Microsoft is “hosed” in the sense of “going out of business” — I think they’re hosed in the sense that I don’t think they have clear path forward with Windows 8. The reports I’ve seen about Win8.1 have been underwhelming, and all my enterprise sources make it very clear that they have no intention of upgrading Win7 systems to Win8. As for Surface as a small laptop — well, we saw what happened to the ‘netbook’ market. Sorry to pick a nit, but for better or for worse, that seems to be one of my strong points (58 years-old sigh… :-). You indicate that Windows Vista had four years as current release to establish a market share (with mostly pre-installs, I would guess) before Windows 7 displaced it. However, the Wikipedia link you provide dates “General availability” of Vista as of January 30, 2007, with “Initial release” (is that even valid, more a release candidate kind of window?) two months earlier (November 8, 2006). Similarly, Windows 7’s “Initial release” is dated July 22, 2009, whereas its “General availability” is dated October 22, 2009.
very small-potatoes self-employed consultant with LOTS of Windows XP-using clients who WON’T listen to my dire warnings (so far, anyway).